Holidays are celebrations of life, little walks off the beaten trail of everyday living...a chance to just be and enjoy what's around us. 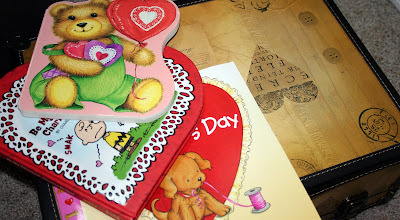 Valentine's Day is super cute for the little ones. It's about the greatest thing that makes our world tick: l.o.v.e. ...It's about hearts and everything sweet and wholesome in between. I like to take opportunities when they present themselves to cuddle up with my boys and softly tell them lessons of life. And Valentine's Day is one of those opportunities. "My sweet boys...when Momma and Daddy say we love you that means that YOU are made exactly how we want you and you don't need to change a thing!" It means that we value everything that is packed into your little bodies. It means that we want to see you shine inside and out. It means we want to celebrate every bit of happiness you can tuck into your pocket. It means that you delight our hearts and we simply cannot get enough of you. So, boys...as you grow each day and relate to friends and family, love them with a wholesome heart. Because love is everything that is good. It will make your heart shine and your face happy. Love because it is so much better than being a bully! Strong men are made of steel and velvet. (I stole the steel and velvet phrase from a book title years ago and it stuck with me!). You boys see and feel how Momma and Daddy love you and we hope you can love that way too because it is a great joy! And even if you try your best, just as Momma and Daddy do, sometimes you may not love completely and it may hurt someone. Momma and Daddy don't always love you the right way but we try...and you know what? If people know that you try your best, then that is simply good enough." helped me prepare this fun Valentine meal. 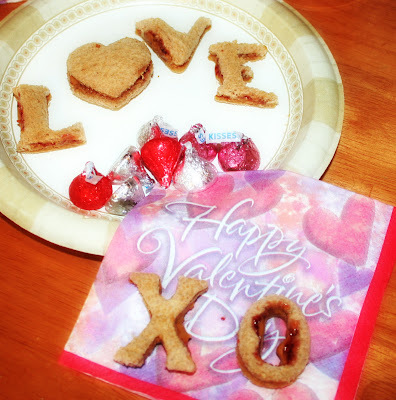 We made PB & J using STRAWBERRY jam to have RED for V Day! Then we took cookie cutters to cut them into festive shapes. The best part for the kids was NO CRUST! And the best part for me was Dixie paper plates! 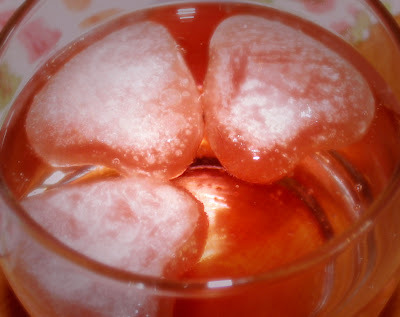 For drinks, I froze Cranberry Juice in heart-shaped trays. 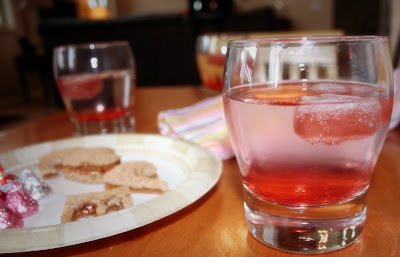 I poured 7-up into glasses and used the Cranberry Juice ice cubes. Then I dropped a bit of cherry juice into each glass. for a frozen slush treat! Buy those trial size scented lotions for holiday use. Bath and Body Works sells all sorts of scents that are seasonal. This one is called "PS I LOVE YOU" and is perfect for V Day. Of course you can keep full size of your favorite lotions but these little seasonal ones are fun to change it up. Each season put a different one out. I LOVE the coconut scent for summertime...etc, etc. What a sweet post. I totally agree about showing those little boys how much we love them. 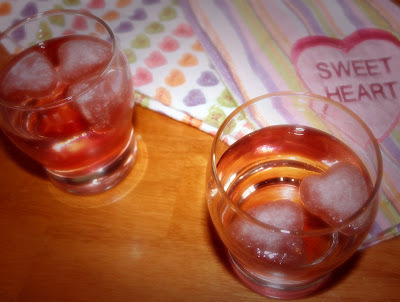 I love the heart ice cubes, what a great idea. 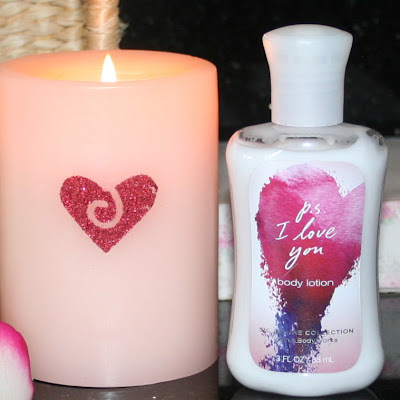 I also agree the PS I love you lotion is wonderful. I love how it smells like Roses. 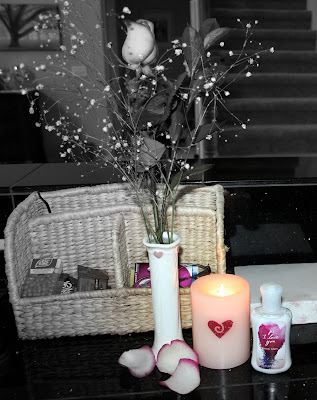 My favorite rose smell is the Yankee fresh cut roses candles. How fun! I love doing special things with the kids on holidays. The drinks look great. I will have to try them with my kids this weekend. What a sweet thing to tell your boys. You are a great mom! what a great idea, I love Valentine's Day! What can I say other than this is a beautiful post! Your boys are lucky to have you as their mom! What a wonderful idea. Looks like the boys had a grand time. Once again, you are a great mom! Lucky boys!!!! 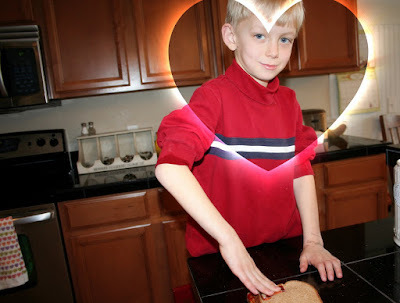 What a lovely, lovely post - and such good ideas for celebrating Valentine's Day with children! What a GREAT!!! idea and the heart shape ice cubes are AWESOME!!! What a sweet sweet post. How blessed you all are to have each other. Who can resist a title like this? A lunch of hearts! This really touched me--I have two sons.The cookies look delicious!